Milk and alcohol. Breakfast of champions. I know that’s what gets me out of bed of a morning, despite all my teary-eyed friends and housemates begging me to switch to porridge. 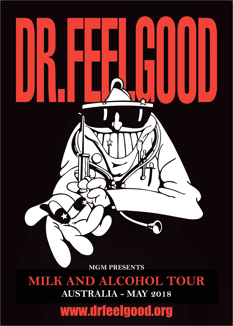 In a somewhat healthier guise, Milk and Alcohol is also the moniker for Dr Feelgood’s triumph Australian tour which – woot! – is making a stop to Canberra. “It’s been over 30 years since Dr Feelgood toured Australia, so it’s a long enough wait when they return in May for a series of shows around the country. “Formed on Canvey Island in Essex in the early 1970’s, Dr Feelgood remains one of the most popular and exciting live rhythm and blues acts in the world today. The raw and uncompromising style of their performance resulted in the album “Stupidity” that immediately went to the #1 position on the UK Charts. “Dr Feelgood have also enjoyed global success with a string of hit singles including ‘Roxette’, ‘Back In The Night’, ‘Milk and Alcohol’, ‘Down At The Doctors’, ‘She Does it Right’, ‘Going Back Home’ and ‘See You Later Alligator’ – which gave the group their first gold record. “The last album to feature Lee Brilleaux, ”Down At The Doctors”, was recorded live at the Dr Feelgood Music Bar on Canvey Island just two months before he died in 1994. “The current line-up features rhythm section Kevin Morris on drums and Phil Mitchell on bass (both 33 years), Steve Walwyn on guitar (26 years) and Robert Kane (formerly of The Animals) the most recent addition, joining in 1999. “Jullien Temple’s film “Oil City Confidential”, originally released in 2010 tells the story of the band’s formative years featuring the Wilko Johnson era. “In 2011, they released a digitally re-mastered “Chessmasters” album …. The band’s tribute to the Chess label, home to many of the finest blues artists of the 20th century and the first Dr Feelgood album to feature Robert on vocals. The band continue to tour extensively around the world and finally back to Australia! The Feelgood will be bring the feel-goods to The Basement, Belconnen on Tuesday May 8. Tickets on sale now from http://www.drfeelgood.org/tour-dates/ or direct with the venue.